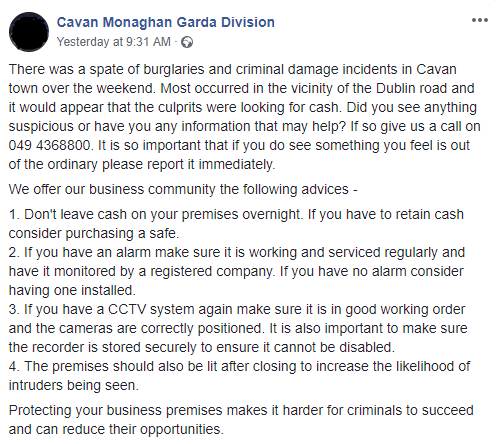 The Cavan / Monaghan area has been rocked by series of burglaries that occurred over the weekend. Five properties were targeted in this latest spate of burglaries. Four businesses and one residential premises were the victims of these burglaries. The Majority of the break-ins happened in the vicinity of the Dublin Road between Saturday evening and the early hours of Sunday morning. These recent break-ins follow on from the latest CSO statistics release which outlined burglary rates between October to December; the Cavan / Monaghan area saw the greatest percentage increase of any Garda Division, with 71% more burglaries than the previous quarter. The culprits were responsible for criminal damage and are believed to have been searching for sums of cash. Gardaí in the area are encouraging homeowners and businesses to remain vigilant of any suspicious activity. They also posted on their Facebook page with some quick tips for the business community. No arrests have been made as of yet, anyone with any information should contact Cavan Garda station. The previous week Gardaí were investigating two residential burglaries in the Baileborough and Virginia areas, entry was gained to both by smashing a window to the rear of the properties. They were also both targeted during normal working hours between 8:30am - 3:30pm. With the increase in the end of 2018 and the recent run of burglaries in the area, we urge our customers in the Cavan / Monaghan area to set their alarm in Stay Mode when at home and Away Mode when leaving their house. Remember that your app can be used to check the status of your alarm and to set it from anywhere in the world.